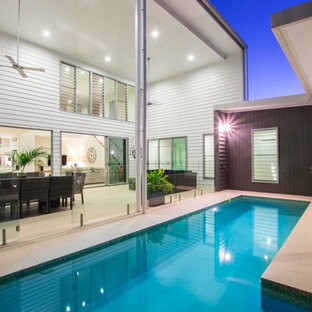 Swimming pools are heavenly during hot Australian and New Zealand summers and are the perfect way to cool down, relax, entertain friends and even get fit. A pool can also create visual interest, especially when you consider features like coloured pool tiles, lighting and landscaping. 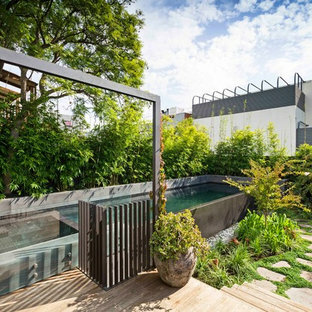 If you are short on space, you might still fit a lap pool, plunge pool or swim spa, all of which could be focal points in your small garden. As you plan your pool design, map out your space and determine what size, shape and style works best for you. 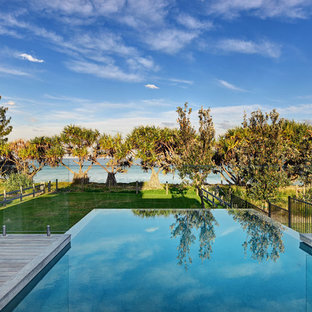 Browse the photos on Houzz for design ideas for above ground pools, inground pools, as well as pool landscaping and novelty features like pool slides or water features. Then, save your favourite photos to an ideabook, and get in touch with the experts behind your favourite picks. 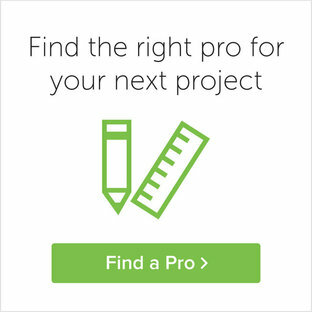 What type of pool should I install? The dimensions of your backyard will determine the type of inground pools you can install. Take into account boundary restrictions and pool fencing compliance. Fibreglass versions are cheaper, and quicker to install; whereas concrete constructions are better suited to tricky sites and give you more freedom in design. If you’re on a tight budget or don’t want to commit to an inground pool, above ground pools are a more affordable alternative. If you only have a small backyard, a plunge pool is a great solution, and can easily run along a boundary wall or down the side of a house. This option is also low maintenance, can be heated for use in winter, and can do double duty as a swim spa. 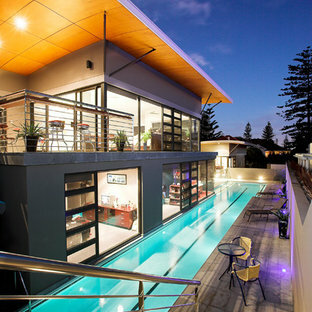 A long, narrow space, on the other hand, could fit a lap pool, whereas a water feature could fill an awkward space. 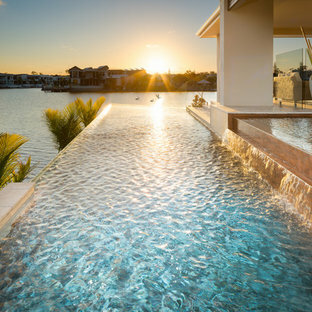 If your backyard features a stunning vista, consider an infinity pool to accentuate the view. What pool fencing options are available? While the specifics vary from state to state, fencing is required of most pool designs. However, pool fencing doesn’t have to obscure your pool design. Glass fencing is increasingly popular for this reason exactly, and is available framed, frameless, semi-frameless and even in-ground. A cheaper alternative is aluminium or steel fencing, which, again, are available in a variety of styles: flat top, loop-top, double-top and wire-based. What pool landscaping features should I consider? To get the most out of your pool, design an area that offers multiple hangouts. Include a nearby barbecue, dining area, seating for lounging and outdoor shower. 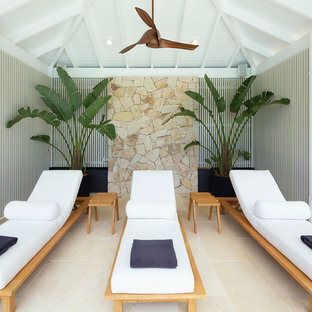 Having shaded areas will give you more reason to stay poolside longer, too. 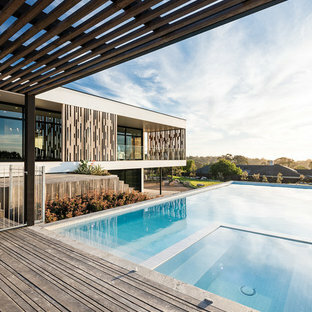 Timber decking and stone paving are popular choices for pool surrounds, and are also helpful in creating zones. Just imagine a raised timber platform with a daybed – a luxurious, resort-style addition to any pool design. Leafy trees and rocks will create a more natural-looking oasis, and will help provide more privacy for swimmers. Where you want your landscape to be the main focus, keep pool equipment and furnishings to a minimum.